A great way to add to your design arsenal is with texturizing your metal. Here are a few options. 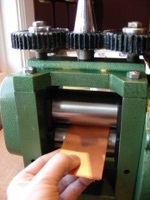 The rolling mill is a very versatile tool. Almost anything can be imprinted on sheet metal that can be sandwiched thinly between two sheets. 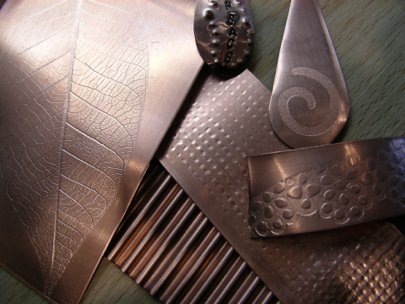 Stamping is the act of making an impression to a specific area of the metal with a focused tool. You can create a repeating accordian fold with this funny little tool which original purpose was a toothpaste squeezer. For this example I am using a piece of cut paper from a scrapbooking paper punch. 2.Sandwich this between two pieces of your metal (Silver or Copper). I am using 26 gauge. 3.Feed the sandwich through the rollers of the mill. There should be some resistance when turning the crank, but not so much that you are unable to turn it. 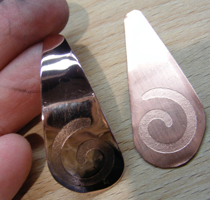 4.The result will be a mirror image on each piece which can now be made into earrings or whatever you like. 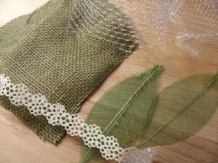 Fabric, lace, leaves, plastic mesh, cut paper, and other non-ferous items can be used to create interesting textures. Trimmed and polished to create a finished earring. The imprint is maintained even when polished. 1.Take 26 gauge sheet (or lighter) and place edge into crimper. 3.Twist butterfly handle and watch the metal come out the other side. 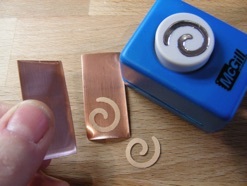 1.Using a letter stamp you can write messages on your metal. After placing your metal onto the anvil, simply line up the stamp where you want the letter and strike the end with a hammer. 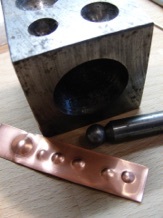 2.In a similar fashion you can create interesting divits by striking a dapping tool over it’s matching hole with your metal sandwiched in between. 3.Punching can be done with a nail or other sharp item that will pierce the surface. Repeated it can make an interesting texture. This piece incorporates letter stamping with punching.